This sweet sixteen cake was one of the funnest cakes I’ve done in quite some time! I have always wanted a reason to do one of these 'topsy turvy cakes' but, until now, never had one. I learned a lot with this one! It is three tiers, each three layers of chocolate cake with chocolate/raspberry mousse. Each tier was frozen and sculpted to get the angles I wanted. Then crumb iced and covered with butter cream. I then cooled the cakes again and covered each tier with fondant separately and stacked as you would any cake! Many parts, including the pearls on top, the diamonds, stars and circles are all dusted with a pearl dust that just made the cake shine!! Hello u create lovely cakes, you have a gift! 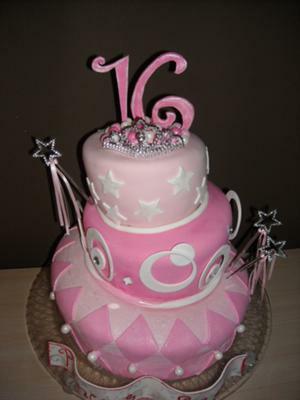 Please email me the cost 4 this cake would like to order for my nieces sweet sixteen. When you have a moment my email is amandaic@yahoo.com. hope 2 hear from u soon. Sorry I only just looked at this email! feel free to email me or to call me. LOVE the cake! how can I get a hold of you? I'm planning my daughter's Sweet 16 right now!! !